Hosted by Tom Stathes, this blog is dedicated to musings, studying, and collecting of early animated film. If you like silent animation, a genre so largely ignored by the historian faction, this is for you! Sponsored by Cartoons On Film. As I always say, lost films truly cannot be considered "lost" until every square foot of the Earth has been searched with a fine-toothed comb. In many cases, "lost" films are right under our noses: in archival or private film collections, waiting to be identified and discovered by those who know something about the film. This week, one fine example has come to light. For years, colleagues and I were very curious about an early series of cartoons titled "Tom and Jerry." Those of us in the know had already been amused by the fact that while there was the famous cat and mouse duo of the 1940s and beyond, Van Beuren boasted a Mutt and Jeff-like duo with the same name in the early 1930s. However, there was this even earlier series, referenced in at least a couple filmographies of silent animation, and you can bet we really wondered what the films were about and what this duo looked like. Us early animation fiends were finally thrown a bone when on February 22, 2010, Jerry Beck reported that Lee Roop was preparing a book on his grandfather, J.L. Roop, the man who animated these mysterious films. For me, at least, it was at this time that I discovered the earliest Tom and Jerry cartoons were actually stop-motion films. 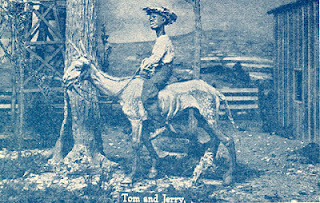 Jerry, on behalf of Lee Roop, shared a few lovely images and tantalizing information about J.L. Roop's mysterious stop-motion films. My mouth watered a bit as I happen to love stop-motion films, especially early ones with curious looking characters and crude movement. I've always looked at stop-motion films as a sort of view into an alternate reality in which drawn or "flat" animation cannot apply itself. I come across many interesting tidbits of information and as readers of this blog already know, many interesting and rare films from the early days of animation. Sometimes, though, new finds are simply announced to me by friends and colleagues who notice items of interest online or elsewhere. Last night, my good friend and research colleague David Gerstein shared the big news with me: by way of Jonathan Boschen, another animation historian and enthusiast, a link to the Tom and Jerry film Gasoline Trail (1923) had been posted on the Internet Animation Database forums. It was put online by none other than Prelinger Archives, a massive collection of offbeat films (usually educational and industrial in nature) that had been collected by preservationist Rick Prelinger. I've said enough, and as you can imagine, I was both shocked and delighted by this revelation. Without further ado, watch the film! Thanks be to Rick Prelinger...and all those who collect forgotten, orphan films and eventually get to share them with the precious small audience that exists for this type of material. Had no idea this was a lost film! Rick, is that you? Always happy to consult on animation you might have...let's talk! Wow, I have been looking for one of J. L. Roop's films for over 40 years. That would be Thank You. Lee, I'm more than honored to have shared the news! I like cartoons very much. It's very enjoyable one. I have more fun to see this. Thanks for this post. I’ve had an almost lifelong interest in early animation and silent film. With the help of this blog, I like to periodically share research and update surfers on what I’m doing in this crazy field that is always full of surprises. The contents of this page are (c) 2007-2012 Thomas J. Stathes. No original text or image displayed may be reproduced without the written consent of the author.